I am a retina specialist located in Fairfax, Virginia. This is just a few miles outside of Washington, D.C. in the United States. I’ve been in practice for almost 23 years. As a retina specialist, I treat patients with problems of the vitreous and the retina. I treat things like retinal detachments, macular degeneration, diabetic retinopathy …. and floaters. I started this website to augment RetinaEyeDoctor.com, my blog on retinal diseases. I needed a special place to communicate with patients with floaters. Over the past several years, I’ve become increasingly sympathetic to the problems of floater sufferers. Floater sufferers are not taken seriously although almost all I’ve ever met have real significant problems. For too many years, patients with significant floaters have been neglected. This site is specifically for those suffering from floaters to offer some insight and education on how floaters may be treated. I’m uncomfortable participating in various forums on floaters and FOV, I feel that I’m intruding. Hence, I created this site to explain my viewpoints and to communicate with whomever may have questions. For a long time, you have been discounted and you’ve been told to get used to them. Many patients are ashamed to have these nasty dark spots floating around in their vision. Treatment is available and is as safe as cataract surgery. Yes, there are complications, but the risks are very uncommon. With the advent of 25 gauge vitrectomy, the procedure has become as safe or safer than cataract surgery… the most commonly performed surgery in the modern world. I encourage you to learn all you can about the vitrectomy, aka FOV. There is nothing different between FOV and vitrectomy. By the way, it’s the only procedure which should be considered. On me ? & is it safe at my age to undergo this surgery at my age ? And will there be any problem in my eyes after this surgery in my later life since I am only 24? Your age should not be a contraindication. I am from Bangladesh age 24 now having the same condition on my eyes.As Doctor Wong is not available in Asia so what can we do ? I will be glad if you contact with me. You’ll have to research looking for a retina specialist near you….I know that you’ve been doing that, but I don’t have anything else to suggest. Hi Dr Wong, I am shahab from iran I developed floaters 13 yrs ago I am 30 now, I wanted to ask you whether you come from Asian countries?, such as Emirates, Qatar, China …. , It is very difficult for me to come to America. Unfortunately, I am limited to my practices in Virginia, USA. Can an fov be perfromed to someone with dry macular degeenration? I just discovered your vitrectomy article and video. I am a Vet and live in NJ, and had my retinal surgery done via Veteran’s medical coverage at Rutgers Hospital in Newark NJ last October. I was surprised to learn that you use a viscous salene solution. My eye surgeon first used oil, then gas. But weeks later there is still a residual gray screen and hundreds of very tiny oil bubbles left. And pressure only 4 months later, so I can’t get the lens for the cataract yet. So your version seems superior. I am hoping my doctor will not just use what you use, but first hose out the eye to get rid of the rest of the oil and debree. 1. Normal Recovery time for your vitrectomy needed so one can then get cornea lens implants? 2. The exact name of the salon solution you use? So sorry for the delay. Please send update? I don’t use a viscous saline solution. Not sure what that might be. Thank you so much for the educational video presentations you have posted online. I live in Vancouver, British Columbia, and I just turned 40 last September. As my birthday present, my left eye had PVD and I went down to see the ophthalmologist down in California to remove the Weiss ring with yag laser. The Weiss ring was removed, however, I have left with numerous specks, strands, cobwebs, etc. I visited him again in November, 2016, hoping he can improve the results better then last time. Unfortunately, the treatment had very little improvement. I am hesitant with the idea of vitrectomy, with many of my colleagues in fear of making the problem worse, but I don’t think I could wait any further. I will be visiting New York City end of January 16 and would like very much to consult with you and perhaps undergo the surgery. My only question to you is out of twenty thousand FOV you have performed, were there any cases in which the floaters come back after the surgery. Thank you! Sorry for the delay. Got caught up in the holidays. I am not aware of floaters coming back – as long as not due to recurrent bleeding or uveitis – neither of which sounds like you have. I suffer from CRVO in my left eye which has left that eye basically non-functional, but I have a great deal of floaters in my right eye that really is limiting my vision. My question is have you ever work on a person with sight in one eye and how long does it usually take before you have vision in the FOV eye after surgery. I visited a doctor who perform laser removal of floaters but he even said it would only provide limited removal of the floaters. Also, does insurance cover this kind procedure? Yes, I have operated on “monocular” patients many times. Vision usually returns quickly after surgery. I’m guessing useful vision, but a little blurry, within 24 hours. To the best of my knowledge, insurance covers surgery. Are you allowed to fly after the surgery? I read that the pressure could cause problems after eye surgery. I’m looking forward to setting up an appointment in the near future to see if it will help me with these horrible floaters! There is no issue with flying after vitrectomy. The ONLY time there is a restriction with air flight is when gas is placed in the eye during the vitrectomy which is common for some retinal detachments or when repairing a macular hole – not a straighforward FOV or vitrectomy. In short, flying after surgery is fine as long as there is no gas in the eye. I had a vitrectomy procedure over two years ago and the results were excellent. Now I have a new very large floater that has appeared. Is it normal for new floaters to appear that long after surgery ? I had the eye checked and the retina is fine. Thank you. Without knowing the details of your case, is it possible that you did not have a PVD at the time of surgery, but have developed one recently? I am A Sabbath Observer and would have a problem seeing you on Saturday if that were the day after surgery. Would it be possible to have the surgery on any day other than Friday? There is the possibility of operating on other days. I would ask you to contact Chrissy to see about scheduling issues. Do you usually perform a PVD during the FOV? My preference is to create a PVD if one is not present. replace it? Are there any problems with the replacement fluid? Yes, the vitreous fluid (aka aqueous humor) replaces itself within 48 hours after the operation. Good question. Vitreous fluid does replace itself within 48 hours. After the operation, your own saline (aqueous humor) will replace the artificial saline used during the operation. I have never heard of problems with saline used for the operations. My retina detached after catacac surgery about 4 years ago. Several sessions of laser treatment finally reattached the retina. However issues occurred that required surgery to place a gas in the eye to help keep the retina in place. This did not seem to work, so silicone was used, vision returned. Then the silicone created rising pressure in the eye some what like glaucoma. Eye drops did not control the pressure, so my specialist removed 99.9% of the silicone and replaced it with gas. The eye had some inflammation. The pressure in the eye finally came down, to 2 and I still could not see. The eyeball has shrunk and is very tender to the touch. Scaring of the eyeball has occurred and I still do not have vision. My surgeon said surgery could remove the scaring, but not recommended at this time as the eye was very fragile. Is there anyone in Indiana or Chicago experienced with recreating the vitreous humor as described on your web site. I feel until this is repaired/replaced my eye will not be in condition for scaring removal. Would you be able to recommend a hospital or specialist in Chicago or Indianapolis that would be able to treat this condition.? You might consider getting a second opinion. You might consider John Pollack, M.D. of Illinois Retina Associates. I am 24 year old male, since 2 months ago, I noticed that I have floaters, a relatively large complex one on my right eye and some tiny ones on the left. I visited a retina specialist and he said nothing is wrong. Can FOV perform for my age, I mean can it remove floaters which are near to retina? Can it treat PVD caused floaters? Not aware of any drug which could cause floaters. Acute floaters in both eyes could be caused by disease/retinal tears, but if you have had it checked out and you are normal, vitrectomy might be helpful. Your age does not influence the decision for surgery. FOV removes the vitreous so the location of the floaters with respect to the retina does not matter. 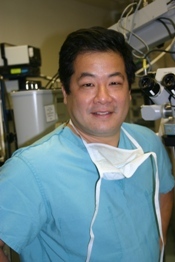 Hi Dr. Wong : If an air bubble is placed into the operated eye following Vitrectomy instead of Saline. Does that mean Cataracts will develop in the operated eye for sure? No, not for sure, but it wouldn’t be surprising. I developed floaters at age 40, 22 years ago while pregnant with my son. I have notice recently that I several new cobwebs. I am a school librarian and use a computer alot as well as read to children daily. My husband and I travel in an RV and I find it hard to relax when seeing stuff flying around my eyes when I should be enjoying the sights and adventures we experience. The only other eye concern my optometrist worries about is a drusin (sp) close to my pupil. However, the drusin has been there for years and there are no signs of MD. I also where blended trifocals and have clear vision with them other than my little floating friends. I am not willing to give up my life by staying locked up in house, but there are times when I can’t wait for night time or a nice dark room. I’d have to examine you to confirm that you would be a candidate for surgery. Given your history, I don’t see any contraindications. Drusen are usually found in the retina, often in the macula, can be normal or associated with macular degeneration. Certainly there are risks to any surgery, but the risks of vitrectomy compare favorably to cataract surgery. Can you recommend a specialist in the Los Angeles area? Hard for me to know exactly who has as much experience. I’ve got 5 kids…not going anywhere soon. Almost any retina specialist performs vitrectomy, but so few are willing to talk about it or perform them. All the best. Thanks for the nice comments. I am hosting a webinar in a couple of weeks. Click here to register here. I have done vitrectomy to remove floater and macula pucker about 3 months ago on my eye. There are 2 things that are bothering me. One is black dots in my vision. The other is I can see some sort of ‘rippling’ or ‘shimmering ‘ effect in my vision. Can you give some possible reasons for these two. How are you doing? I apologize for the delay. Black dots can be anything from blood to debris from the actual surgery, including the membrane. Shimmering or rippling may be from the actual stimulation of the retina when the pucker was peeled from the retinal surface. All the best. Here’s a link to register for my upcoming webinar if you are interested! I am okay accept my eye problem. If the shimmering or rippling due to the *stimulation of the retina * , can this effect will go off after some time ? Recently my this operated eye also have the early signs of cataract ,that is the vision not so clear and the eye will feel strained easily. Can cataract cause the eye strain or could it be due to other reasons? I can only advise that you consult your own eye doctor. Cataracts blur vision and can give you the sensation of straining. Make sure to tell this to your eye doctor. I have been experiencing floaters since my early teens and I am now 36 years old. My floaters have gotten worse over the years and are at a point now that I am ready to have them treated. I have had my eyes checked many times over the years. The most recent was about 1.5 years ago when I went to a retina specialist. Once again I was advised that my eyes were perfectly healthy and that a vitrectomy was an option, but that a cataract would likely develop. The doctor seemed to discourage me from having the surgery. I really like how much attention to give to patients suffering from floaters and I wish I were closer to you, but I am in central Florida. Is there a retina specialist in central Florida that is as passionate about helping patients with floaters as you are? Is there anyone you would recommend? For the sake of having this surgery done right and with the best possible outcome, I would certainly travel to see you in Virginia if need be. Not aware of any in FL. So sorry. Dr Wong. I contracted uvietis 01/2016 in my left eye. In 03/2016 gone in left eye and moved to right eye. Both have no inflammation at present- 7 months. Tests showed nothing except HLA-B27. I do not suffer from arthritis and know of no one in my immediate family who has been treated for arthritis including aunts, uncles, etc. My vision tests at 20/20 both eyes with glasses. But, right eye has foggy vision and it is extremely difficult to drive at night. I can see but everything in right eye is hazy,there are floaters and lights present a large halo. I’ve been told -“Well, you have 20/20 vision-what’s there to complain about”. Can a vitrectomy help me? Fairfax Va is not far from my WV home. I would love to meet you and examine you. Likely you have remnants from the uveitis giving you glare and hazy vision. I am 28 and developed floaters in both eyes at the exact same time around two years ago. At that time I started developing afterimages/trails which can vary from day to day. The floaters have increased in number since they first developed. I have been inspected by several doctors who have found no issues except for “fairly significant” lattice in both eyes. I was curious if you had young patients with sudden floaters in both eyes along with my other symptoms. If so, have any of your vitrectomy surgeries helped or exacerbated the afterimages? I have had many young patients, with normal eyes, who have developed sudden floaters in both eyes. I don’t think lattice is associated. Vitrectomy is often helpful. The after image is not a common complaint…so I can’t really answer. We are having another webinar tomorrow night, if you haven’t signed up, please do! 1. What % of FOV patients have post operative retinal detach/tears? Trying to gauge that % and risk. 2. What are your views on long term glaucoma risk after a vitrectomy and in consideration of the fact that I have an IOL? Thanks so much! You are a wealth of knowledge and give us floater sufferers much hope. Sorry for the extreme delay. 1. 1-2% get tears. Fewer retinal detachments. 2. I am not sure there is a correlation. Is it also possible to have a FOV if the glass body removed a little Bit? I am 28 years old and habe These floaters 6 years. Sorry, can you resend email? I don’t understand your question. Hello ! I had cataract surgery & a multifocal lens put in. 2 weeks after the surgery I had a complete PVD causing black cobwebs & hazy vision. I was referred to a retina specialist here in western NY Where I live. I was told that fortunately there was no tears holes or retina detachment. I also had a small hemorrhage behind the eye. That has since cleared the dr said but I still have this large white hazy blob that I’m looking through. The dr said it’s a huge floater that “should eventually settle down”. He said it is like a jellyfish. It floats out of my line if vision briefly and I see clearly but then I blink & it’s right back and it’s like looking through a cloud. It’s beyond annoying and it’s effecting driving especially at night and my contrast is diminished quite a bit. My surgeon said give it another few weeks and if it’s still bothersome he would consider having me see the retina dr about a vitectomy. My concern is – will this affect My multifocal lens implant and are there any greater risks associated with having this done after the implant surgery? I am 58 yrs old. I’m in good heath with no high bp or diabetes. I would appreciate your input about my concerns. Also I have to have a cataract removed from my other eye & im petrified this will happen to the other eye as well so I’m putting off getting it done becuz of being so traumatized from what should have been a simple & safe cataract removal. Thanks in advance for your reply! So sorry for the extreme delay. I hope, by now (after my lengthy failure to reply) that things have resolved. If not, I’d be happy to see you as a patient. Western NY is not to far from DC! I live in New Jersey, I have had floaters for probably 10 years now and I am 23 years old. I wear glasses so I was wondering if it is possible to have this surgery, and afterwards at a later date also get LASIK surgery or a similar operation. Just want to be sure I could get both. I don’t see any reason why you couldn’t have both vitrectomy (FOV) and then vision correction surgery. All the best – please excuse my extreme delay in responding (my fault). I am 40 and developed eye floaters in both eyes over the last 2 years. They are giving me a hard time despite the intent to tolerate. I read many statistics, not sure which to believe, that vitrectomy basically guarantees a cataract formation due to oxygen affecting the lens. Some doctors do not induce PVD to reduce the likelihood to develop cataract…. I was wondering if you can comment on this, as it is the only reason I am afraid to undertake a vitrectomy. Do you know any doctors in Australia? Don’t know any doctors in Australia. I can only state that my experience is very different than what you state: I don’t notice cataracts too often, I don’t see a relationship to PVD, etc. In doing my research it appears there is a high likelihood of Cataracts developing post surgery within 24 months or less. Also more risk in repairing these due to the changes in the Vitreous body post surgery. Why don’t you discuss these risks? Perhaps that is the result of another’s opinion? I’m fully transparent about my experience with my patients and the infrequent cataract formation. I have had floaters in both eyes for the past year. I’m 36 years old. In both my eyes I have the whisper type that catch up after moving my eye and some smaller black dots. Also, in my right eye I have a large black dot almost in the center of vision that moves with my eye much more quickly than the others and is very annoying to say the least. I have been very disappointed searching the internet for solutions to floaters until I found your website. 1. Do you know if insurance usually covers a FOV or do they claim its not something that must get done like a cosmetic thing so its not covered? I looked on my insurance’s website and didn’t see anything about this procedure. 2. If insurance doesn’t cover a FOV what is the general cost per eye? 3. Have you had any patients that have had floaters return years later? 4. What is the average time for the procedure from start of surgery to end of recovery? Ben. Sorry for the ridiculous delay. My fault. Sir,How much time does fov takes to be operated? Dear. Doctor Wong will not describe you my history in details because you here such 1000 times. I ony ask do you know maybe which you would reccomended specialist which can prepare fov in Europe? I do NOT know anyone in Europe. So Sorry. Sir frill after fov is common problem. If happene frill after fov will possible this treatment with another vitrctomy ?? Hello dear doctor wong i m from Pakistan i have one question after vitrctomy frill is common problem or if happene frill someone after fov. will frill treatment possible with another vitrctomy ? I’m 52 and have alway had floaters, I remember as a kid looking up and the white ceiling and making them move around thinking they were cool. They never really caused me much issue but The within the last few years they have exploded (esp in right eye)and are causing me lots of issues, seeing computer screen at work, reading newspaper or subtitles on TV sceen and really impeding one of my great loves, golf!!! I live in NJ so only 3-4 hours away from you. I have a few questions though. 1. I had lasik survey back in the late 90’s does that have any relevance in if I would be a candidate for this surgery or not? 2. Does any medical insurance cover your procedure or is it seen as elective? 3. If not covered by insurance what is the est costs of this procedure? 1. Lasik does not change your chances of having surgery. 2. Usually, if not always, but contact your insurance carrier. Again – I’m embarrassed I just found your questions and it took me so long to respond. Hello Dr. Wong: I am post erm surgery in the left eye 17 months. I had cataract surgery & vitrectomy at the same time. My peel has left me with distortion, which I guess is a 50/50 chance. I see images larger and wavy in that eye. My right eye has a 2+ mild cataract, and a large floater which I have had for 6 years with no diminishing. Also kind of a gauzy film that acts like the black floater coming in and out of view. My retinal surgeon is suggesting that I have a vitrectomy along with the cataract surgery which he will do, as he can do that surgery. He thinks this will strengthen this good eye to take over more for the one that had the ERM surgery. Other doctors say is dangerous and foolish to remove floaters. I do not have pathology in my good eye at this point, but I have so much anxiety over the vitrectomy due to the outcome/result of the ERM eye. But you seem to be saying not to be afraid. Is that the case. I am 72, and I had perfect vision before all this started. PVD with Weiss ring started in 2012 in the good right eye. And two years later Pvd in the other eye which then developed the macular pucker. I live in Seattle. Recommendation for an opinion here? As I stated in your other comment, it is my preference to remove the ERM as soon as warranted to maximize your visual prognosis. Best of luck, Randy. So sorry for this long delay. I actually thought I had replied. I know Shahem Kawji, M.D. in Newport, CA.